Have you thought about sprayable lotion before? I received some for review a while back. I loved it. Great for the kids too! When I ran out, I started thinking about making my own out of some of my favorite lotions. Start with these ingredients....Your favorite lotion, a bowl and blender, spray bottle, funnel. My squirt bottle was able to hold 27 oz. (Old febreeze bottle) So I added about 23 oz. of water in my mixing bowl. I squeezed about a 1/4 of the bottle of lotion in too! Mix with blender. Add lotion if you want a thicker consistency. Now just use your funnel and add it to your squirt bottle. 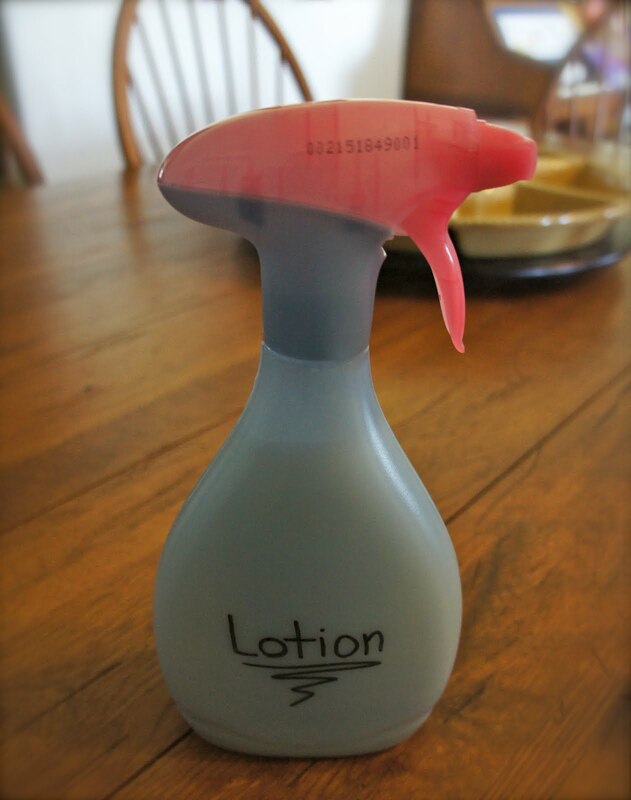 Write lotion on the bottle, so no one accidentally squirts it where it doesn't belong. LOL Like your furniture or hair. Your lotion will easily spray out. We love it! Hard to tell in the photo below, but I sprayed it about 3 times here. Rubbed it in and it was light and moisturizing. It doesn't make my hands feel slimy or full of gunk like some of the thicker lotions make you feel. Some make me want to wash my hands after putting it on and what's the point. Right? Anyway, I hope you like this!